Project obstacles and solutions: BioLife Plasma Services is a leader in the collection of life-saving blood plasma. They announced the construction of a new collection center in Greenwood, Indiana. Weigand Construction was chosen as the general contractor for this project. Ground was broken for the new facility in the fall of 2015, with an opening scheduled for the summer of 2016. Early site work included paving the sidewalks and parking lot with concrete. Most of this work was done when the temperatures had dropped below freezing. 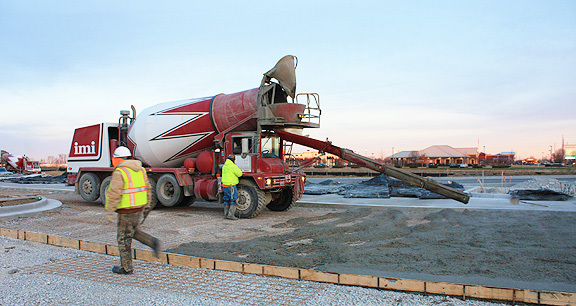 There were 2,000 yards of concrete in the parking lot project. Weigland needed a concrete that would set up quickly in the cold weather, but would not corrode and compromise the steel mats used as reinforcement. IMI supplied imix FreezeGuard, a non-chloride concrete mix that accelerates set times in cold weather. In fact, imix FreezeGuard gains more strength as the temperature drops - just the opposite of normal concrete mixes. Since it is chloride free, the reinforcing steel was not compromised by the admixtures. Weigland's crews were able to keep this project moving despite the cold temperatures. For more information on cold weather concrete and imix FreezeGuard, click here.